Bones found in Morocco place our lineage 100,000 years earlier and nowhere near where we thought. In 1961, miners digging into a promontory in Morocco, some 50 kilometers from the Atlantic Ocean, discovered something very unexpected—a handful of stone tools and an ancient, nearly complete human skull. Eager to learn more, archaeologists proceeded to excavate the site, known as Jebel Irhoud, uncovering five more fossil human bones, as well as dozens of flint tools thought to have been made by Neanderthal hunters. Based on these finds and the methods of archaeological dating available at the time, researchers concluded in the 1960s that Jebel Irhoud’s inhabitants were African Neanderthals who roamed the region 40,000 years ago. The scientific team decided to reopen excavations at Jebel Irhoud in 2004 in hopes of obtaining a new series of dates for the site using advanced archaeological dating methods. In a surviving part of the site, the team discovered 16 more fossil human bones, as well as remains of prey animals, such as gazelles, zebras, and wildebeests. In addition, the researchers found evidence of fire in the oldest layers, along with several burned stone tools. These heated tools allowed the team to date the layer richest in fossil human bones using a well-accepted technique known as thermoluminescence dating. Hublin says the fossil human bones found at Jebel Irhoud belonged to at least five individuals—three young adults, one adolescent, and a child about eight years old. “The faces of these people would have been short, flat, and retracted,” says Hublin. “It’s the face of people that you cross in the street today.” Even so, the humans at Jebel Irhoud would have had a somewhat heavier build than humans today. And their brains would have been organized differently than ours, Hublin adds. At Jebel Irhoud, for example, the 300,000-year-old braincases—the part of the skull that houses the brain—are elongated in shape and accommodate a larger cerebellum, the part of the brain that plays an important role in maintaining balance, coordinating voluntary movements, and fine-tuning motor skills. Modern humans have a similar overall cranial capacity, but we possess a smaller cerebellum, suggesting that our gray matter is wired in a different way. 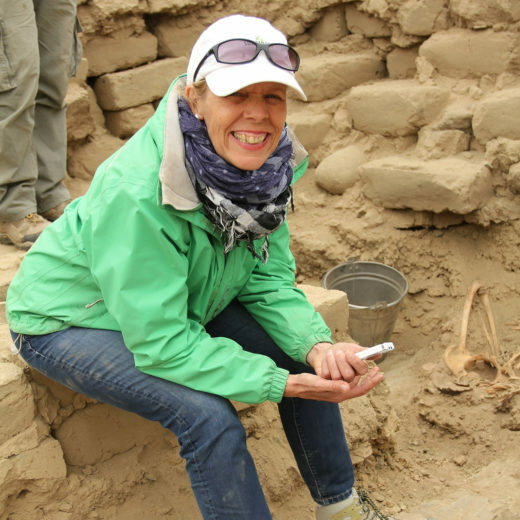 Team member Shannon McPherron, an archaeologist at Max Planck Institute for Evolutionary Anthropology, thinks the climatic conditions at Jebel Irhoud would have been somewhat wetter than they are today, based on clues gleaned from the site’s faunal record. The landscape would have been green and open, with clumps of trees—a habitat favorable to animals such as gazelles and zebras. The humans who overnighted at Jebel Irhoud, McPherron adds, were hunters armed with what was then the latest stone tool technology—sharp-edged stone flakes likely used as spear tips as opposed to the heavy stone axes or cleavers carried by Early Stone Age humans. Israel Hershkovitz, a paleoanthropologist at Tel Aviv University in Israel who was not a member of the team, thinks that Jebel Irhoud adds an important new piece to our picture of human evolution. He accepts the dating of the site and thinks the team has correctly identified the fossil bones. “I personally believe that it is indeed a remote member of our species,” Hershkovitz notes by email. But other scientists are taking a more cautious view of the findings. Mark Collard, an evolutionary anthropologist at Simon Fraser University in Vancouver, British Columbia, remains to be convinced that these 300,000-year-old humans were part of the lineage that ultimately gave rise to H. sapiens. “I think it’s probably best to view the specimens as adding to our understanding of the variability of Middle Pleistocene hominins,” Collard notes by email. Certainly, the new findings from Morocco are bound to stir much discussion in the scientific community, and many paleoanthropologists hope to see other human fossil bones surface from this critical period in human evolution. “It will be interesting to see how the story unfolds from here as more fossils are found,” paleoanthropologist April Nowell at the University of Victoria in British Columbia writes in an email. Cite this Article: Heather Pringle “Homo Sapiens Just Got Older—Way, Way Older,” Hakai Magazine, Jun 7, 2017, accessed April 21st, 2019, https://www.hakaimagazine.com/news/homo-sapiens-just-got-older-way-way-older/. Traditional knowledge meets Western science on the central coast of British Columbia.